Researchers from Scripps Institution of Oceanography at the University of California San Diego and University of Washington have found that small river outflows in the presence of strong waves remain along the coast longer than previously thought before dispersing offshore. This new finding, published in the journal Geophysical Research Letters, could change the way health officials monitor pollution and control beach closures. 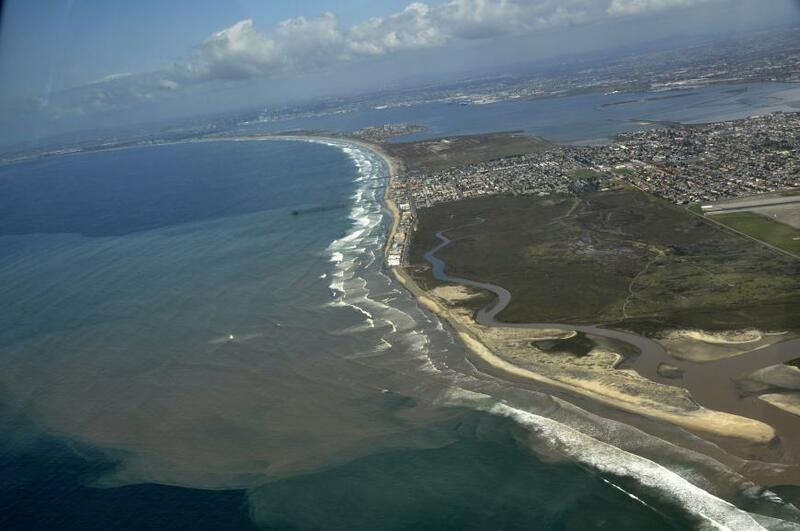 The interaction of estuaries and surf zones–the region where waves break–is important for the transport of contaminants, nutrients, and sediments. Numerous studies have focused on the two regions separately, but there has been little emphasis on how estuaries and surf zones interact. These are highly energetic areas, influenced by waves, currents, turbulence and tides. Adding a river mouth into the mix means the variables are hard to tie down. But Angelica Rodriguez, a PhD student at Scripps and lead author of the study, wanted to do just this. Specifically, she wanted to know how small river plumes disperse in coastal waters in the presence of breaking surface waves. Her model results show that wave-current interactions trap water in the surf zone such that it remains very close to shore and travels parallel to the coast rather than being transported offshore as it does more readily in the absence of waves. This kind of knowledge could give public officials a better idea of where along coastlines to look for pathogens, especially after storms when runoff is likely to carry pollutants from land to the coastal ocean via river plumes and other small drainage outlets (storm drains, creeks, etc.). Rodriguez is a native of Imperial Beach and Chula Vista, communities located in southern San Diego along the US-Mexico border. This motivated her to study processes that contribute to water quality issues there, where nearby beaches are frequently closed by pollution. Rivers and other coastal outflows such as storm drains and creeks are notorious for transporting pollutants from agriculture, urban development, and other human activities. The Tijuana River Estuary along the border is less developed than many other Southern California estuaries, yet it experiences very poor water quality from upstream contamination, and is one of a few pollution point sources in the region. “Pathogens in the ocean are eliminated in several ways, including sunlight degradation, age, and dilution, the last being what this study focused on,” said Rodriguez. “Our results indicate that wave-current interaction is significant to the dilution process and may explain why high levels of pathogens remain in the surf zone and are transported along the coastline,” she said. Rodriguez used idealized numerical models to determine these conclusions, coupling two models (a wave model and a hydrodynamic, i.e., circulation model) that simulated conditions typical to southern California estuaries and offshore swells. This coupled modeling approach has been used to study other processes, such as those occurring in the surf zone in the absence of river flows, but has never been utilized in this way. “This project is exciting because it is the first time dynamics of buoyant plumes and dynamics of the surf zone have been linked together,” said Sarah Giddings, a coastal/estuarine researcher at Scripps and co-author of the study. Nirnimesh Kumar, faculty at Civil and Environmental Engineering, Univ. of Washington and a co-author of this study further emphasized that the coupled modeling approach also allows for exploring the parameter space of changing freshwater input and wave conditions. Many coastal regions in Southern California face the same pollution concerns as Imperial Beach. Dense populations and sparse rainfall couple to make downpours problematic for the rivers and streams in a given area. It is not uncommon for beachgoers to be advised to avoid the ocean for up to 72 hours after a rainfall, which washes accumulated pollutants from land into rivers and storm drain outfalls en masse. “This study is an important step toward understanding all of the relevant physical processes occurring in the ocean that can inform more efficient water quality sampling efforts,” said Rodriguez. This research was supported with funding from the National Science Foundation GRFP and the Blasker-Rose-Miah Fund of The San Diego Foundation.